In this category recent-updates you will find all of the reviews we have received from our amazing and very kind wedding clients. We have been blessed to receive over 345 amazing wedding reviews across every platform of the internet, to include Wedding Wire, The Knot, Google, Angie’s List, Yelp and many many more. We also have been published in many wedding magazine to include Charleston Wedding Magazine, Carolina Bride, Charleston Style& Design, Destination Weddings & Honeymoons, Unveiled, Studio Photography & Design, Grace Ormonde. We at King Street Photo Weddings have been so blessed to receive all of this above and hope you will enjoy reading all of this content and amazing reviews. 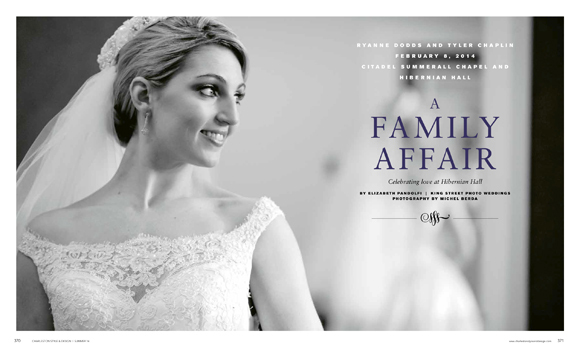 What a great way to start the day, then by opening the most recent summer Charleston Style & Design Magazine, by flipping the pages and realizing that one of my weddings, at the Citadel Summerall Chapel & Hibernian Hall has a 6 pages feature. Every wedding photographer dream is to have great clients, a beautiful day, and images that compliment just that. Satisfying your client is the best reward, but when a publisher and the staff are in Aww…! with the images and then print it into their magazine, that becomes priceless. I personally want to thank Quentin & Rob and the entire staff, I also, more importantly, want to thank my clients, for giving me such a huge honor for being a historian on their biggest day. Please enjoy this issue.